On Tuesday(April 3rd) Abigail Spencer was spotted heading to an appearance on the Today Show in New York to discuss the new season of 'Timeless' and how it was un-canceled. 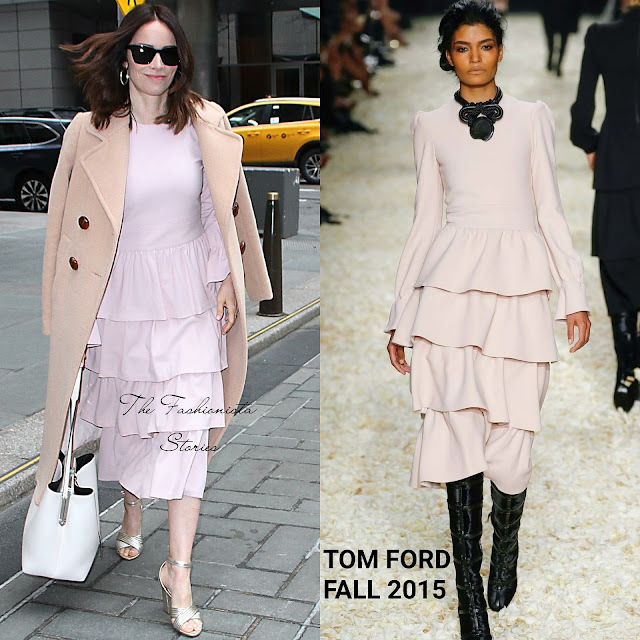 For her outing, she kept warm in a camel wool coat by CHLOE with a pink long sleeve TOM FORD FALL 2015 ruffle tier skirt dress underneath. Ruffles weren't a big trend in 2015 but they are these days which is one of the reasons her look works for the early morning appearance. She accessorized with dark sunglasses, gold hoops, a white PROENZA SCHOULER bag and gold TABITHA SIMMONS sandals which topped off her look.